After nearly 60 years of conflict, a US based organization has decided to call for “Justice for Jews from Arab Countries”. One stated objective is to push for the introduction in the US Senate and House of resolutions that any explicit reference to Palestinian refugees in any official document must be matched by a similar explicit reference to Jewish and other refugees. The views of the pro-Arab lobby on the issue are not known. In fact the pro-Arab lobby is yet to be identified. 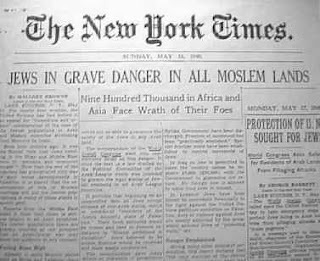 Below, extracts from Warren Hoge’s article in the New York Times on the 5th of November 2007 published under the title: Group Spotlights Jews Who Left Arab Lands. The organizing group, Justice for Jews from Arab Countries, says it is referring to the more than 850,000 Jews who left their homes in Arab lands after the declaration of the state of Israel in 1948. To back the claim, the group has reproduced copies of a draft law composed by the Arab League in 1947 that called for measures to be taken against Jews living in Arab countries. The proposals range from imprisonment, confiscation of assets and forced induction into Arab armies to beatings, officially incited acts of violence and pogroms. Subsequent legislation and discriminatory decrees enacted by Arab governments against Jews were “strikingly similar” to the actions laid out in the draft law, Mr. Urman said. (…)With the creation of the state of Israel in 1948, the status of Jews in Arab countries changed dramatically, because most of those countries either declared war on Israel or supported the war to destroy the new state. The group cites United Nations figures showing that 856,000 Jewish residents left Arab countries in 1948. “This was not just a forced exodus, it was a forgotten exodus,” said Irwin Cotler, a former Canadian minister of justice who is scheduled to be the main speaker at Monday’s program to open the campaign on behalf of the Jewish refugees. For that reason, he said, the main goal of the campaign was to raise public awareness rather than to seek compensation. “It’s not about the money, it’s about the other components of redress, recognition, remembrance and acknowledgment of the wrongs committed,” he said. (…) The United Nations says that 711,000 Palestinians left Israel-controlled territory in 1948 and 1949 and that today, along with their descendants, the number of Palestinian refugees is at least four million. “There is mention, as there should be, of Palestinian refugees, but no mention of Jewish refugees,” Mr. Cotler said of the annual commemoration. Another objective is to push for early passage of resolutions introduced in the US Senate and House that say that any explicit reference to Palestinian refugees in any official document must be matched by a similar explicit reference to Jewish and other refugees. The American-sponsored peace conference in Annapolis is planned to take place before the end of the year to address core issues of the Israeli-Palestinian conflict like borders, the status of Jerusalem and the Palestinian refugees. “We want to have this meeting now, in advance of the Annapolis conference, to ensure that this issue is front and center in the international awareness as it should be,” Mr. Urman said. (…) Mr. Cotler said a change in perception would help bring the region’s antagonists together. Tayeb I have a solution then, all the Jews from Arab lands can return to their original lands and homes and all the Palestinians expelled from their lands can return to their homes and land. Wouldn't that be justice for all? Thanks you for raising awareness on this issue, we "Arabs" really tend to forget those who we label as "enemies". I am very troubled at usage of the term "Jews from Arab countries", don't we say "Arab Muslims" or "Arab Christian", why do we, and like the Zionists, say "Jews from Arab countries" and assert their very Zionist narrative of all Jews are necessarily rootless. It is ahistorical when we say "Jews from the Arab countries" or when the Zionist narrative assume that the Jews are "diaspora" longing for their "homeland" in occupied Palestine. So terminologies matter in academic resistance. Unfortunately, the Arab Jews are used by the Zionist as a counter argument against the Palestinian refugees, and also used by Arabs, as that commenter above, as a counter argument against the Zionist argument 'in regards' to the Palestinian refugees. The Arab Jews in themselves, are not a case, but their case is always about some other people's case. I think it's pathetic, that we claim to be humane and the good guys but we treat our people the same way the enemy treats them. That's why I decided to devote my career on Arab Jews, to smash both of these two arguments. And btw, congrats for new author Nisrine for joining Arab Democracy team, I am not necessarily interested in the topics she writes about, but I enjoy reading her arguments. Good luck Nisrine and Arab Democracy. Golania you have very valid arguments on the issue and i think there's not enough space in the arab world to discuss such matters and it's a pity, while israelis, and specifically their lobbies use all the democratic, western, and lobbying channels to raise and promote every detail related to their "homeland" and their people... I'm not saying that the arabs should use the very same ways jews are exploiting in order to achieve their interest, but at least, i think there's enough potential in the arab world, and specially between the arab diaspora, to be much more influent. And i have here an idea i would like to know what you all think about it: the arab islamists for example, using the democratic western channels to finance and plan terrorist attacks. Wouldn t they have been more human, powerful, and respected if they canalized that potential in terms af a regular influential system based on declared and lawful lobbying practices that would have maybe led them to achieve their interest???... I know it's unrealistic for the islamists right now to do so, certainly after 9/11 and all the anti islamist regulations in the west... so those who left and do not have a choice but to do so are the modern laic arabs abroad, who should, i think, strenghten the links with the inside modern powers in their homelands first, and then operate each from his or her position abroad in order to start an accumulation process that will pay with time (and maybe a long time)... but in the end, the results will definitely be on 2 levels, the local one and the international one. I think Wassim's comment on an exchange of refugees is a valid one if placed in its right context. If it is true that 'Arab jews' or 'jews living in Arab countries'(And the correct terminology is for these people themselves to decide)were forced into exile in Israel, then their return to their previous homelands is a matter of time and can be encouraged by creating a state of tolerance in these countries. At the moment Arabs and muslims are barely able to tolerate each other.So working for tolerance and understnading is in itself an anti-Zionist act a hundred times more effective than Katiousha rockets. And you still think that you have one problem, the Palestinian problem? I think we are not getting the heart of the problem if we do not look at the big picture. So, if you thinking about swapping people; do not forget the number one problem in each country. In Syrian for example, the number one problem is the people who are Arab or Kurds or any Syrian citizen kicked out and can not retune to his home because his home would be prison if he dare to show up. Now, go figure how many one like this. And if you think those are numbered in hundreds, please revise your data and get to know that those counts in hundreds of thousands and growing every year. In Iraq the number we all know, in Iran, all over, the problem is big and need fundamental change in the whole region. So, please if you are a Syrian, speak about Syria and if you are Palestinian speak about your issue and do not shield other to cover up yours. This is my take, I hope I could covey what I wanted to say if not, please excuse me and forgive my intrusion. What I was trying to say that we should not loose focus of which is major and which is minor. I meant we never should forget to put the issues in order. The article talks about the Jew claiming their right of return to Arab Lands which they forced to leave. This is a legit issue and goes under the right of people to return to their homeland. Let’s start from the beginning; first, humans are more importance than the land. This is eternal fact. This mean serving human needs comes before the accommodation of the state needs or goal for the return of the land. And the second should not be on the expense of the first. All human needs from food, to shelter and human rights and so on, come before the land, and government are responsible for those needs. Government can not freeze time for the purpose of returning the land. From this point, the value of human in the occupied land (Golan for example) should be more important to us than the return of the land. Otherwise fifty years from now most of them will speak Hebrew and will have establish a new belonging to the new state which is by now lasting more human life span. Then, each citizen has the right to his homeland before even the land issue. That is mean returning to the land under any authority is more important that the return of the land to other authority. This means that the issue of return of the Syrians who are not allowed into their country for any reason is above even any other issue like the occupied land. This mean, our major struggle actually not with Israel, it is with our own government because it deprived our people from their right to return. This mean the article which talk about the return of the Jews to their homeland will raise another more important issue which is the return of the expelled Syrians ( who are counted in hundreds of thousands, because they oppose the regime), this issue will become very important and will take precedent. From this point the issue of the returning of the Jews is bad news for the authoritarian government because will raise other issues might make them never have a good sleep. From here we can understand why the opposition for such an issue will be great, specially from authoritarian states, because it will open a can of warms for the government and for our conscious which is still behind on human scale and does not prioritize things properly in this global age. In other world, what apply to super power does not apply on us. Our priorities should be our human and we should demand this prioritization for our sake. Because in the end I wonder if we are going to learn from history. If I understood u well, we are getting to the same conclusion from different angles.Which is that authoritarian governments cannot bring back the land and even if they did their victory would be worthless since the populations will be subjected to their tyranny. This is a chicken and egg situation: We have to delay democracy,human rights and economic development in the name of 'THE STRUGGLE AGAINST THE ENEMY'.But can we really achieve any kind of victory with a repressed, unhappy and poor society? Personally I am not convinced anymore. This is not chicken and egg situation; we do not and should not delay human rights and economic development in the name of the struggle against external enemy or against colonialism or imperialism, we should change our porosities and stop getting deceived by their rules those nonsense. Then we will not worry about any type of victory because victory in this struggle will be satisfactory and then our regional problem will be solved in civility and intelligence. If you want to understand me right, I’m saying we should stop listen to the authoritarian government regarding the land and we should keep emphasizing the priorities such as the return of Syrians whom been deprived from coming back to Syria including the Jews. We should not pay attention to the authoritarian propaganda claiming that danger is external while it is in our midst. The economic situation, human rights and free speech and expression are more way more essential. yes I agree with you anonymous, in a way we should not pay attention to the intimidation process used by our regimes internally and justified by a war and dangers our region is facing... but, the price of ignoring their practices is too high we just need to have a look at the number of political prisonners in syrian prisons. the trouble is that people abroad are not thinking about coming back, at the contrary, those inside are dreaming about leaving... actually, i would like to raise a question here: do you guys think a diaspora is able to move and get mobilized and powerful if there is not in the country of origin a dynamic movement able to prove he can change the situation? Let me tell you brother, those Jew did not file the right of return in the congress because they want actually to come back, no, they did that to reserve their right. Most people outside might not want to come back, but that does not lessen their right to come back and claim their belongings. And guys living in the country should not let down their brothers right. I will predict in the future more groups will file the same petition with the congress. For the people inside, I know they want to run away from the oppression and go out, numbers are speaking loud. My prediction by the year 2020, Syrians outside will be double the Syrian inside. It is terrifying number to think of it. It is no question of when thing will change at all, it is a question of to start the right track and might take ages. The whole culture of what is right and what is wrong need to be changed. People inside should not think of themselves strangers to the people outside as the regime wants to portray them, actually people in the Diaspora are the back bone for the people inside who are struggling for freedom, and they are proudly and brotherly the provider for people inside. Connection never will be cut. Each family outside is feeding other part of the family inside. People in the Diaspora also are not one block, the regime still successful in making wedges between them. All the hidden and forbidden taboos inside about sects, religions, areas and clans surface strong out in the open in the Diaspora and become no taboo but still create mistrust. Ms. Shaaban is relatively successful so far in stopping the influence of people in Diaspora and damping their voices. In reality, she is the minister of providing the west with labor and professional. When she is outside, she only talks about the enemy from outside while she is on his lands visiting the sightseeing next day. She is working as the ambassador of manpower. However, this is not going to last for long, and everyday when the regime gain one support from outside they loose two. The Syrian opposition abroad is a volatile unrepresentative group with a sectarian outlook in most cases. Until they come up with a serious alternative the regime can whistand pressure after pressure. And the west having learned from the Iraqi experience is unlikely to apply serious pressure anyway because no matter how unpleasant the Syrian regime is chaos is more frghtening for them. sorry but is it accurate to talk about one syrian opposition? i don't think so. there are secterian ones of course, but it's unfair to label it all as secterian. and another question here: why is it becoming a kind of common sense to say that in case an arab regime will fall, the only 2 options available are chaos and islamism?? ?...is it all what our societies can give? This study by an academic explains what the Jews are asking the Arab countries which they have been left behind of. This is a great thing to happen, because it opens the window for other groups to ask for the same thing. It is in the end the beginning of long lists of litigation against those authoritarian regimes that think no one can do anything to them and no one will punish them. Now think of the people who left Syria in the 60s because they were as called capitalists who were been kicked out and confiscated their land and properties, factories, homes, and think of a whole strata of the society which have been affected from that time till now. Think of opposing parties or the ones who did not agree with the regime or the one the regime thought they are dangerous; those counts in millions of Syrian people, but sadly there are no data to give a number yet. Think of what the regime have done to hundreds of thousands of innocent people living outside the country when he cooperated with the American and gave them the names of Syrian who lives peacefully in America claiming they are terrorists. I have couple of friends who lost their job in USA because of that. By the way, I’m not against the regime but I’m against not having the opportunity to defend yourself. Now this I hope may inspire people inside Syrian to start stand up to their rights and defended strongly from now on. I personally think ur point is very valid and connects with what has been said before.I do not believe that the lobby behind this intended for its action to have such consequences.The whole point is to undermine the righ of return for Palestinians. But by doing so they have opened a debate that is actually quite healthy on the current regimes in the Arab world but also on the real history behind the emigration of jews from the Arab countries.And it is well documented that the story isnt as simple as they claim. It is a pleasure to find on the net a forum that promotes civil discourse and respect for all isdeas. On right of return, who wants to return to Israeli does not seem to have ever been really address, just the demand of regimes. As several posters have commented Palestinians are not the only people who could demand this right in a blanket forum. No criteria isver seems to be mentioned and compensation for actual losses never considered. Nor does this demand consider what they would be returning to and the effects on the economy of the countries they return to. Quite interesting to find yourself in the middle of an ethnological debate. funny feeling, that. back to the subject though. a population swap has already taken place - palestinians out of israel, arab jews in. what would be the point of yet another one? cater to the demands of some regimes? a tool to destroy israel? from the point of view of the average arab jew, trying to restore a community once it has been eradicated is futile. there has been intermarrige and loss of language, not to mention that the root cause for the original 'departure' is heavily reliant on the lack of place for jews in the nascent arab nationalism. do you honestly think any jew would entrust themselves into such a thing? the suggestions to undo what is now evidently 'fait accompli' are rather ludicrous. the one thing you CAN do for arab jews is encourage a PROPER reconciliation based upon recognition of grievances done to us. some assurance of a normal life instead of the one robbed of us. so here's to all readers and especially to wasim: the restitution of grievances is by the wishes and needs of those who had been wronged, not those who had wronged against them. we have been robbed of the chance to live a normal life in countries we inhabited for millenia. we demand back the only feasible solution to provide that back to us - a country of our own, that doesn't have to face continous actions to destroy it or wipe it off the map. thank you. I wonder whether the concept of 'Arab Jew' has any standing in Israel. But what is more interesting than the ethnological debate is the lack of recognition or empathy for the position and the opinion of the 'average Palestinian'. I don't see in your words anything different from the perpetual victim status enshrined in Israeli discourse . Your welfare, which is your right, cannot be at any cost, and surely not at our expense. The first step to peace will be when you recognise the pain and suffering the creation of Israel has generated. Whether you were to blame originally or not, the fact today is that your stance over the settlements, Jerusalem and the establishment of a viable Palestinian state are primary perpetuating factors. 1. it does not. the prevalent term is 'mizrahi' and jews see themselves as culturally distinct from arabs. but this is more probably than not a result of political climate. deep down, there's no point in denying our close contact, one that outweighs the involvement of the west by order of magnitude, and the ethno-sociological part of it is meaningless. arab or not, we're tied, one way or the other. 2. my comment contains no such thing as this is not the subject of this post. the subject of the day is arab jews and this is a rare opportunity for discussion. nonetheless i'll be happy to provide my own input. even those who believe that 'jordan is palestine' may do so because they believe this offers a better future for the average palestinian instead of perpetually fighting israel. and even those who believe in the two-state solution may do so while sincerely hoping in their hearts that the resultant palestinian state will be corrupt and a horrible place to live in. in short, there is no direct correlation between political solution and compassion for the average palestinian. even those who fight hamas with their utmost heart, may believe that it is the only way the situation may improve for the palestinians. 3. interesting. which of my words have a victim attachment to it? have i mentioned the farhud? the aden riots? the ouijda riots? the copious amount of looted property? they're all missing of this post, by purpose. I tried to keep my assessment to humane/realistic factors and not emotional/financial/political ones. the return of arab jews, whether 'just'/'politically correct' or not, is not realistic and involves actions which are not humane. i did mention 'grievances' as a gross generalization, which is the minimum required to set this discussion into the framework. 4. the problem is that you are pitting the political against the humane. the palestinian problem is political in nature. were they all 'miraculously' naturalized today, arab countries can certainly give them a life of equal quality to the rest of their citizens, were they so to wish. infact, some palestinians lived pretty well off in iraq owing to saddam's support. they will further not feel estranged, as part of the arab space. as for jews, the opposite is true. even under better conditions, arab countries could not provide this for jews. even today, they still can't (e.g. the recent murders and expulsions of anti-zionist jews in yemen). what's worse, even for non-jews this is not working, with lebanon being dysfunctional secterian mess and christians slowly being purged out of the middle east. 5.further onwards on this, if i were to believe that a two-state solution will bring peace and prosperity to the palestinians, i'd go for it. but it simply won't do unless radical changes occured in arab society at large, one that would obsolete the need for a 'big satan' and 'small satan' to cover up for regime corruption and incompetence, for lack of rights and for financial mismanagement woes. there are a lot of groups in the arab world itself opposed to the two-state solution, from SSNP and the ba'ath party to ikhwan. do you call their position a primary perpetrating factor as well? who decided arbitarily about the two-state solution as the optimum? this needs further discussion. I am pretty sure we will not resolve this complex issue through this online debate so you are right better focus on the initial topic of the post. For me , it is a non issue. If Arab Jews wish to re-settle in any Arab country, this should be facilitated in full. The truth is that the incentives aren't there: politically, economically and in terms of security. The Middle East in its current format isn't friendly to minorities. (The latest exodus of Iraqi Christians is only one example). With regards to the SSNP, The Baath and the Ikhwan. They have their own scores to settle with each other before addressing the Zionist issue.In fact they use the Zionist issue to avoid explaining the shortcomings in other aspects of their ideology. That said. The majority of Arabs would more or less reluctantly accept that Israel is here to stay. The land will need to be 'fairly' shared one way or the other, whether in 2 states or one state.The compromise will be painful but unavoidable. Thank you for a well-balanced post. It seems like you're one of the few that really get it, hat tip to you. The incentives for an en-masse resettlement aren't there, true. but if the option was there, even a token one would do wonders, at the very least maintain an ember of the glorious communities that once presided. it pains me to hear of lebanese 'rubbing their eyes in surprise' hearing that wadi abu jamil was once a jewish neighbourhood (just one particular instance i've encountered lately). it has lots of value in not letting this much disperese. about ashkenazi jews... i'd hate to rip the mask, but more often than not, they don't get it (and that's being polite). for many of them, the nakba is some kind of yuppie hobby - light a candle, go to a demonstration, and then feel cleansed and purified for the next 48 hours, ofcourse after picking up chicks at the demo. the 'disengagmentists', as in 'we'll throw them a bone and they can choke on it' don't get it either. a territorial compromise is useless if all it breeds is a corrupt palestinian state that can't provide for its citizens. perhaps we're more intolerant and more entrenched, but we hold the key to a solution based on deeper mutual understanding than you'd ever get with ashkenazi jews or a promise of true co-existance. now don't get me wrong about this, but the concept of bilad a-sham makes more sense to me than trying to squeeze more states in the mess. ofcourse, i would differ with the SSNP/ba'ath vision of it regarding the character of it, but as part of a novel federalist framework, one could undo much of the damage done by both western colonialism and the arab-israeli conflict, while having some traits appeasing even to radicals on both sides. but for that to even be considered, one of the multiethnic projects in the area must be successful, and we're running out of time and hope on this. Haven't heard of that documentary. i'll look for it. Well . It certainly been a pleasant debate. I hope there will be other opportunities to revisit it. Let me know how you get on with the documentary. I do owe you one interesting tidbit in return. search for the works of nissim malul and articles he published. I wonder what would be your take on his writings. Nissim Malul was born to a Tunisian family in Zepat in 1892. At a young age he moved with his family to Egypt , where his father became a Rabbi in the Jewish communities of Cairo and Tanta . He studied in Jewish schools in Cairo , and completed his higher education in the American College in Tanta , where he studied philosophy, Arabic literature and journalism. At this period he started publishing in the Egyptian newspaper al-Muqattam. In 1911 he returned to Palestine , and started working for the Zionist office in Jaffa . His main role was to respond to the anti-Zionist articles which were published mainly in the Palestinian Arab-Christian newspapers Filastin and al-Karmil . He was fluent in Arabic, and his articles were published in other newspapers as well in Egypt and Lebanon . He was also involved in a short publication of a Jewish newspaper in Arabic, called Sawt al-Uthmaniyah , the Voice of Ottoman, with his friend Shimon Moyal. This newspaper targeted the Arab population in Palestine , in an attempt to explain the aims of the Zionist movement in Palestine and convince the Arabs of its good intentions. During WWI Malul was expelled to Damascus by the Turks, because he was suspected of anti-Turkish activities. He escaped to Egypt and stayed there until the end of the war. When he returned to Palestine he established two Arabic newspapers, Al-Akhbar and later al-Salam , both of which were funded by the Zionist movement, and preached Jewish-Arab understanding. Between 1922-1925 he became a member of the Zionist National Committee and later participated in the Arabic workers newspaper Ittihad al-Ummal . He was a true arab jew, and trying to work within the arab world/paradigm and find a place for zionism and make the bridge. I don't think his writings would be accessible for me today, but perhaps you might have access to them.